In a rapidly changing healthcare environment, clinical healthcare professionals face difficult choices concerning what is best for their patients. In some cases, these choices become enmeshed in ethical dilemmas; additionally, what patients choose for themselves may not be in unison with what the family or physicians believe should be done. Even between seemingly similar individuals, value systems may prove to be radically different. This course will assist healthcare professionals define the predominant ethical theories and principles used in health care, determine any legal and regulatory implications, and in collaboration with their colleagues and patients/clients, make effective decisions that determine the appropriate course of treatment or refusal of such, for and with those for whom they care. This course is designed for all nurses and allied healthcare professionals. In support of improving patient care, NetCE is jointly accredited by the Accreditation Council for Continuing Medical Education (ACCME), the Accreditation Council for Pharmacy Education (ACPE), and the American Nurses Credentialing Center (ANCC), to provide continuing education for the healthcare team. NetCE is accredited by the International Association for Continuing Education and Training (IACET). NetCE complies with the ANSI/IACET Standard, which is recognized internationally as a standard of excellence in instructional practices. As a result of this accreditation, NetCE is authorized to issue the IACET CEU. NetCE is approved as a provider of online continuing education for certified nursing assistants through the California Department of Public Health Licensing and Certification Division. Nurse Aide Certification (NAC) Provider #7005. This program has been pre-approved by The Commission for Case Manager Certification to provide continuing education credit to CCM® board certified case managers. The course is approved for 15 CE contact hour(s). Activity code: H00031534. Approval Number: 180001211. To claim these CEs, log into your CE Center account at www.ccmcertification.org. NetCE designates this continuing education activity for 15 ANCC contact hour(s). NetCE designates this continuing education activity for 18 hours for Alabama nurses. AACN Synergy CERP Category B. NetCE is authorized by IACET to offer 1.5 CEU(s) for this program. CCMC Ethics credit is approved for this course. The CCMC Code of Professional Conduct will be referenced in this course/program. The purpose of this course is to assist healthcare professionals to define the predominant ethical theories and principles used in health care, determine any legal and regulatory implications, and in collaboration with their colleagues and patients/clients, make effective decisions that determine the appropriate course of treatment, or refusal of such, for and with those for whom they care. Describe the history of ethics, specifically as it relates to the physician-patient relationship. Identify the historical events, including three human experimentation studies, that brought about measures to ensure patient rights. Discuss the Karen Ann Quinlan case as it influenced national and state healthcare policies. Review the impact of the Nancy Cruzan case on healthcare delivery and policy. Discuss national ethical standards frameworks and their relationship to ethical decision making for patients. Define terminology regarding bioethics, including the seven principles guiding medical ethical decision making. Compare the five ethical theories as they relate to healthcare. Review the basics of forming an analytical ethical framework. Identify appropriate uses of ethical frameworks in the healthcare professional's practice. Outline Kohlberg's six stages of moral development and their importance in understanding ethical decision making from a psychologic perspective. Describe the complex ethical issues facing healthcare professionals today. Describe elements of a usable policy statement and guidelines for ethical decision making in patient care. Analyze the three case studies presented at the end of the study and identify the steps to resolve the ethical dilemma described in each. In a rapidly changing healthcare environment, clinical healthcare professionals face difficult choices concerning what is best for their patients. In some cases, these choices become enmeshed in ethical dilemmas; additionally, what patients choose for themselves may not be in unison with what the family or physicians believe should be done. Even between seemingly similar individuals, value systems may prove to be radically different. The tool that healthcare professionals rely upon when ethical dilemmas or value conflicts arise is the ethical decision making process. Imagine the situation where a patient refuses life support, but the family says they want everything done. What if a patient's family members want life support and interventions stopped, and the physician refuses to discontinue therapy? What about the known drug abuser demanding narcotic pain management? Or, what of treatment for persons who are complicit to their disease (the alcoholic who is on the list for a liver transplant, the diabetic who is dietarily indiscreet, the sedentary scholar who does nothing for cardiovascular fitness, or the healthcare professional who stockpiles lipoproteins and grade "A" stressors and who eats well-marbled meats)? Ethical decision making tackles many pressing issues facing the healthcare profession. In order to chart a problem-solving course, all healthcare professionals involved need specific tools to assist in this endeavor. Understanding the ethical shop talk prepares the healthcare professional for the extraordinary demands of today's high-tech medical environment. Ethical precepts and principles contained within the described ethical systems can help the nursing professional to conceptualize a problem-solving approach to assist in resolving the ethical dilemma. Whether decision making involves an individual facing end-of-life choices or a society setting healthcare policies, these ethical systems and principles are at the very root of the matter and aid the healthcare professional in demystifying the blurred lines that can develop in bioethical and problematic situations. The blending of ethics, legalities, and medicine has come to be known as bioethics. The field of bioethics is a relatively new field. Its emergence into history came in the 1960s because there was a need to discuss how research and healthcare decisions and regulations could be made, who could make them, and what their long-term implications would be. In the late 1960s, philosophers, theologians, physicians, lawyers, policymakers, and legislators began to write about these questions, to hold conferences, to establish institutes, and to publish journals for the study of bioethics. In 1969, the Institute of Society, Ethics, and the Life Sciences was established at Hastings-on-the-Hudson, New York . Two years later, the Kennedy Institute of Ethics was established at Georgetown University, Washington, DC . Prior to the 1960s, medical care decisions were part of the paternalistic role of physicians in our society. Patients readily acquiesced care decisions to their physicians because they were regarded almost as family. What drove this resolve of patients to acquiesce their medical care and treatment decisions to their physicians? Rothman believes physicians were given such latitude by their patients because they were well known and trusted by their patients and the community in which they practiced. There were no specialists. One physician took care of a patient and family for a lifetime. The frontier physician often knew the patient from birth to adulthood, made house calls, and was a family friend who knew best what the patient should do with a healthcare concern . Since the 1960s, physicians have generally become strangers to their patients. The trend away from the family doctor making all the healthcare decisions toward a healthcare system replete with specialists, policy makers, ethical codes, administrative codes, and informed consent was brought about largely by three events in U.S. History. First, World War II research and experimentation (e.g., experimentation on concentration camp prisoners by the Nazis, research on atomic bomb survivors) brought attention to people as test subjects and what rights should be recognized on their behalf. Second, the modern structuring and organization in healthcare delivery moved patients from their familiar surroundings of home and neighborhood clinics to the often intimidating, large hospital. Third, the medical technologic boom brought life-saving interventions; people now live longer due to technology that allowed the discovery of treatment modalities, including the much acclaimed antibiotic therapies. Extensive publicity about three research projects resulted in the establishment of the National Commission for the Protection of Human Subjects of Biomedical and Behavioral Research . The first project involved elderly patients with chronic illness who were injected with live cancer cells in an effort to discover whether the cells would survive in a person who was ill but did not previously have cancer. No consent was obtained from patients or family members before proceeding. The second significant event began in 1932, when the Public Health Service initiated a syphilis study on 399 black men from Tuskegee, Alabama. The goal of the study was to observe the men over a period of time to examine how the disease progressed in individuals of African descent. When the study began, there was no cure for the disease; however, fifteen years into the study, penicillin was discovered to be a cure for syphilis. The research participants were never informed, and treatment was withheld in spite of the fact that by the end of the experiment in 1972, 128 men had died either from the disease or related complications . Finally in 1967, children with mental retardation at the Willowbrook State School, New York, were given hepatitis by injection in a study that hoped to find a way to reduce the damage done by disease. Although consent was obtained in this study, the consent sometimes had an element of coercion in that gaining admission to the school was difficult and parents were given a guarantee their child would be admitted if they consented to the participation of their child in the study . In response to these events, the National Commission for the Protection of Human Subjects was created in 1974 by public law. Finally, in 1979, the commission published The Belmont Report: Ethical Principles and Guidelines for the Protection of Human Subjects of Research . This commission recommended that all institutions receiving federal research funding establish institutional review boards (IRBs). These boards, made up of researchers and lay people, review biomedical and behavioral research proposals to ensure that they meet ethical standards for protecting the rights of the potential subjects. For many, this was an initial entry into what would later be called bioethics. In 1973, the first edition of the Hastings Center Studies pointed out the problems and the needs to become centerfold in the developing healthcare research projects. Remarkable advances were projected in the areas of organ transplantation, human experimentation, prenatal diagnosis of genetic disease, the prolongation of life, and control of human behavior . All of these had the potential to produce difficult problems, thus requiring that scientific knowledge be matched by ethical insight. Soon, the federal government, private philanthropists and foundations, universities, medical schools, and committed professionals moved quickly to address these questions. The federal government supported programs through the National Science Foundation's Ethics and Values in Science and Technology (EVIST) and the National Endowment for the Humanities, which developed applied medical ethics courses for both medical students and college undergraduates. Both public and private universities established departments, institutes, or programs in bioethics, including some in which graduate studies could be pursued. Professional organizations (including local bar and medical associations) began to establish committees to look at ethical issues in healthcare. In addition, such interdisciplinary organizations as the Society for Health and Human Values (now the American Society for Bioethics and Humanities) came into existence, including among their members physicians, nurses, social workers, attorneys, theologians, and philosophers . Hospitals also began to consider how bioethical concerns affected the care they provided patients. In 1976, the Massachusetts General Hospital Critical Care Committee published its recommendations for treating hopelessly ill patients and for using critical care facilities. In Roman Catholic hospitals, committees were formed not only to discuss such specific care issues as sterilization, but also to consider the more general question of how Catholic values should be implemented in Catholic hospitals. In November 1978, The President's Commission for the Study of Ethical Problems in Medicine and Medical and Biobehavioral Research was created . Its members began work in January 1980. The United States Congress charged them with conducting studies and reporting on a number of topics, including the definition of death, informed consent, and access to healthcare. By spring 1984, the commission had published nine reports addressing many of the problems facing the healthcare system. These reports stand as a foundation for the organized and socially sanctioned study of the ethical implications of high-technology medical care and ethical regulation to the healthcare industry itself. The remainder of the 1980s and into the early 1990s saw continued emphasis on the protection of individual rights, but even more attention began to surface regarding allocating resources and demonstrating the effectiveness of complex treatments, especially in terms of the quality of life achieved by prolonging lives. The President's Commission, like the National Commission for the Protection of Human Subjects before it, established a model for finding consensus where it existed and for articulating ethical conflicts when consensus could not be found. They did for the nation what each ethics committee does for its own hospital or individual health agency. It was during these transitional years that ethics, law, and medicine began to form an individual-focused alliance. The legal and medical alliance of the past generally sat on opposite sides of the bed. On one side of malpractice suits, lawyers sat as prosecutors, while on the other side the medical community sat as defendants. This is how most associated these two entities. Ethics primarily played the role in professional behavior and how one was to practice his profession. Never before had the three joined forces in an ongoing effort to assure the individual patient's rights to this degree. It was the New Jersey Supreme Court Decision in the Karen Ann Quinlan case that brought bioethics to the level of the individual through the media and transformed physician paternalistic authority into patient-physician shared decision making . As noted, patient autonomy issues came into public focus in the 1970s when the legal community set a precedent for deciding withdrawal/withholding of life-sustaining treatment. Although there were many related cases with decisions on medical treatment and decision making for competent and incompetent patients, two cases are recognized as landmark cases and were the most important in influencing the medical and legal community. These two cases were most responsible for moving the primary healthcare decision making into the arena of the individual. These court cases are the previously mentioned New Jersey Supreme Court Decision in the Matter of Karen Ann Quinlan (1976) and the U.S. Supreme Court Decision in the Matter of Nancy Cruzan . From these two cases, and more specifically from the Nancy Cruzan case, the Patient Self-Determination Act of 1990 was enacted . In the case of Karen Ann Quinlan, the concept of acknowledging a patient's rights and, in this case, the family's right to speak for an individual came to the public via the televised and printed news media. The plight of Karen and her parents began when she presented at the local hospital, unconscious, possibly from ingestion of a mixture of alcohol and barbiturates. Placed on a ventilator and with little hope of regaining consciousness, her physicians related this grim prognosis to Karen's parents. Karen's father went to the New Jersey court requesting he be made his daughter's guardian and in so doing would be permitted to consent (for her) to discontinue ventilator support. The New Jersey Attorney General and the County Prosecutor stood firmly embedded in their advisement that to remove the ventilator from Ms. Quinlan constituted criminal homicide. Medical experts testified that under the current "medical standards, practice, and ethics," the ventilator must be continued . The Karen Ann Quinlan case is significant because it was the first case to deal specifically with the question of withdrawing ventilator support from a permanently unconscious patient. It is often cited as a source for the importance of the privacy right in life and death decisions. The difference between this and the Quinlan case is that a feeding tube, and therefore continuation of artificial feeding and hydration, was the central focus and seemed to be viewed differently than other life-sustaining treatment measures. The Cruzan parents fought to have the artificial feeding tube removed from their daughter. Nancy was not comatose in the common sense, but awake, yet not able to function on her own. To many, PVS was not seen as synchronous with terminal illness. As a result, the court determined that only if there was proof by clear and convincing evidence that she (Nancy Cruzan) authorized such treatment (or rejection of it) prior to losing her decision-making capacity would they rule to discontinue the tube feeding. In making decisions for incompetent patients, surrogate decision makers should effectuate the patient's own preferences expressed before the patient lost decision making capacity (the subjective standard); however, if these preferences are not known, the surrogate, based on whatever evidence is available, should approximate what the patient would have wanted (the substituted judgment standard). If there is not information about the patient's preferences, the surrogate should make a decision that is in the patient's best interests (the best interests standard). The Nancy Cruzan case was the ultimate landmark decision that led to legislation that would give legal rights to individuals to make healthcare decisions for themselves. Those decisions could then be written down as directives for use in the future of an individual, should the individual not be able to speak for him or herself and found to be in a future healthcare situation requiring decisions regarding further treatment choices (or refusal of such) in the life of that individual. This legislative act became known as the Patient Self-Determination Act of 1990. According to the Hartford Institute for Geriatric Nursing, all adult patients, regardless of age (with the exception of patients with persistent vegetative state, severe dementia, or coma), should be asked if they have a living will or if they have designated a proxy. Institutions may not discriminate against or offer or refuse care to a patient based upon whether the patient has executed an advance directive. The first type of advance directive is called a physician directive, sometimes called directive to physician . The precedent form is the living will, an earlier, legally non-binding form. The living will allowed an individual to state his/her treatment choices should he or she be found in a terminal state, comatose, and/or in another condition leading to imminent death for which the physician saw no cure. The patient stated that he/she be allowed to die naturally without medical intervention, with only comfort measures employed. The second type of form is known as a durable power of attorney for health care (DPAHC) and allows the individual to choose another person to act on his or her behalf should the person become incapacitated and unable to do so at any future time . This document offers more comprehensive choices for the individual by giving more scenarios and noting the patient's wishes in those situations in the future. The DPAHC states the person's wishes in writing, as does the physician directive, but goes further into the circumstances under which future healthcare decisions may need to be made. It also allows another (a surrogate, also called an attorney-in-fact) to act on the patient's behalf. The named individual becomes the patient in terms of his or her right to receive the same information required for decision making, as the patient would have received if he or she were able to decide for him or herself. This form also must be signed by the individual and notarized or witnessed. From 1991, when the PSDA was first implemented, to today, most individuals have not completed advance directives and/or do not have them when they enter healthcare agencies that fall under the umbrella of the PSDA. What does this mean for those working in the healthcare field? A method of making an easier end-of-life decision is available, but not often used by the patient. Conflict between patient autonomy and physician paternalism, poor communication, institution or physician fear of litigation, and/or family disagreement with the patient or healthcare professionals continues to be an issue. More policies or guidelines are being adopted to assist the process so that, even when advance directives are unavailable, dialogue can be initiated with family members who can legally act for their loved ones. It does not address the cases where the DPAHC surrogate is a non-relative and relatives disagree with the surrogate, and therefore, the patient's wishes. It does not settle satisfactorily the right of the significant other, the named surrogate vs. his sibling, or the present wife vs. the ex-wife, who wishes to make decisions for the patient without an advance directive. Those cases make for interesting studies but are to be decided by directives from law and hospital policy regarding who can speak for the individual without an advance directive. Many situations require only listening and someone to support the patient and family through the process of decision making. The Joint Commission for Accreditation of Healthcare Organizations, or Joint Commission, has established standards on patient rights, including ethical decision making. Very clearly, the Joint Commission has outlined that hospitals should have defined policies and procedures allowing patients to create and modify advance directives. The 2000 Joint Commission Standards regarding patients' rights to formulate an advance directive, to have a mechanism in place to deal with ethical issues, and for their rights to accept or refuse care, is found in Figure 1. Because the information in Figure 1 presents so many useful concepts in a single page, it remains a part of this course although it is no longer contained in the current Joint Commission manual . This form has since been replaced with an entire section titled "Rights and Responsibilities of Individuals," which appears in the 2017 Comprehensive Accreditation Manual for Hospitals published by the Joint Commission. This section outlines the ethical standards that healthcare organizations must follow in order to obtain or maintain accreditation. The expanded standards section makes it easier for healthcare organizations to test their compliance and for reviewers to rate them. The Joint Commission requires healthcare organizations to follow their state laws. If a person is from out of state, they may have an advance directive that does not comply with the state laws where the patient is hospitalized. For hospitals treating patients who do bring advance directives from out-of-state, it advisable to ask them to complete an advance directive for the state in which they are being treated. What if the patient presents to a hospital in a coma? The hospital must work with the advance directive provided. Some states allow surrogate decision makers for patients under certain conditions, such as terminal illness or vegetative state. Those laws usually require the physician to certify that the patient meets the medical conditions before allowing a surrogate decision maker to step in. When there is no advance directive, some states allow the patient's spouse or adult children (or other direct relatives listed in a specified order of preference) to decide for the patient. Ethical decision making is the generic term for the process of making a decision within an ethical context in a specific setting (e.g., business, education, or medicine). Ethics are the beliefs an individual or group maintains about what constitutes correct or proper behavior . To put it simply, ethics are the standards of conduct an individual uses to make decisions. The term morality is often confused with ethics; however, morality involves the judgment or evaluation of an ethical system, decision, or action based on social, cultural, or religious norms [15,16]. The term morals is derived from the Latin word mores, which translates into customs or values. The foundation from which ethical principles originated began from debates and discussions from ancient times. These ethical principles then became the theoretical framework upon which actions as individuals and societies are based. Most prominently, the Bible and Greek philosophers, such as Plato and Aristotle, created most of the familiar ethics and morals in use in Western society today. How do we then go from theoretical ethics to the day-to-day practical application of those principles in today's high tech society? It really boils down to a deductive reasoning process. The process starts with the broad and general, often abstract global ideas of how people should act rightly within society. Then, the process narrows in focus to a smaller group or individual situation in which the ethical principles act as a guide for daily living. Further, when a situation presents itself that contradicts the "norm," it may cause a dilemma. When these dilemmas are of an ethical nature, we often say the situations are controversial or called into question or infringed upon a group or individual's rights based upon accepted ethical theories and moral practices. How does one move from the general ethical concepts, based on religious or philosophical theoretical frameworks discussed later in this course, and apply them practically to patient/society healthcare decision making? Generally, an ethical conflict presents itself when a person's or group's ethical values or principles are challenged or conflict with one another. It is imperative to identify what principles or values are in conflict so that an appropriate resolution can be made. A dilemma occurs when one is faced with what is perceived (or is in reality) to be no alternative, only one alternative, or an either/or choice situation. This dilemma scenario leaves the individual with limited, often painful choices. "Have the surgery or die," may be the only two alternatives given to a patient. This can leave the patient immobilized, powerless, feeling subservient and victimized, and with no sense of control. Providing options may assist the individual by giving him or her a sense of freedom and participation in the decision-making process. The nurse is often the person who can act as an advocate and resource to the patient. Whether an ethical dilemma exists or not should be the first question the nurse asks. It may simply be conflict arising out of poor communication, usually resolved when clarification and information gathering occurs. Once an ethical dilemma or conflict is determined to exist, one can begin a step-by-step process to open the discourse and begin the decision-making process. There are a myriad of ethical issues facing patients, families of patients, and healthcare professionals today. Examples of these issues include organ transplantation, fetal surgeries, infants with severe anomalies, lifesaving surgery, neglect, trauma, inability to reach healthcare services, and the rationing of healthcare. Still other issues involve competency of healthcare workers, nurse-physician relationships, treating non-compliant patients, and many more situations applying to individuals and to those facing our nation on a societal level. One of the most common ethical issues facing healthcare professionals in patient care settings is the withholding or withdrawing of treatment. Most healthcare institutions are required to have policies and procedures in which the rights of the patient/family and the duties of the healthcare professionals are outlined. It is only when there is a conflict between the parties involving value or moral principle differences that a dilemma may arise. Often, the real problem may be one of three non-ethical related issues: poor communication between the involved parties or an administrative or legal ambiguity. The first step that should be taken is to gather information about the patient's diagnosis, prognosis, treatment options, and the best medical judgments regarding life expectancy and quality of life with or without treatment. This must include discussion of the risks and side effects of such treatment. Of equal importance, the patient (if legally competent) must be fully informed and have his or her statement of wishes honored. Should the patient be temporarily or permanently unable to speak for himself, the immediate family (if available) should be consulted. In most states, laws or statutes on the right to die, withholding and withdrawing life sustaining treatment, and organ donation identify an individual's immediate family, usually in a specific order of priority, who can speak for an individual when the individual can no longer speak for him or herself. One question to ask the patient is whether or not he or she has an advance directive, and if the response is yes, to make it available to the healthcare team. When the family is present, the nurse should determine the family's agreement or disagreement with the patient's wishes, written or spoken. Always, special attention must be paid to administrative factors, such as risk of liability, current institutional policies, and the role of economic factors for the family. With this information gathered, it should be apparent whether or not a value conflict exists. Many times just the process of gathering information allows for clarification and for differences to be resolved. If an ethical conflict ensues, the next step is to articulate the ethical principles that are opposing one another. 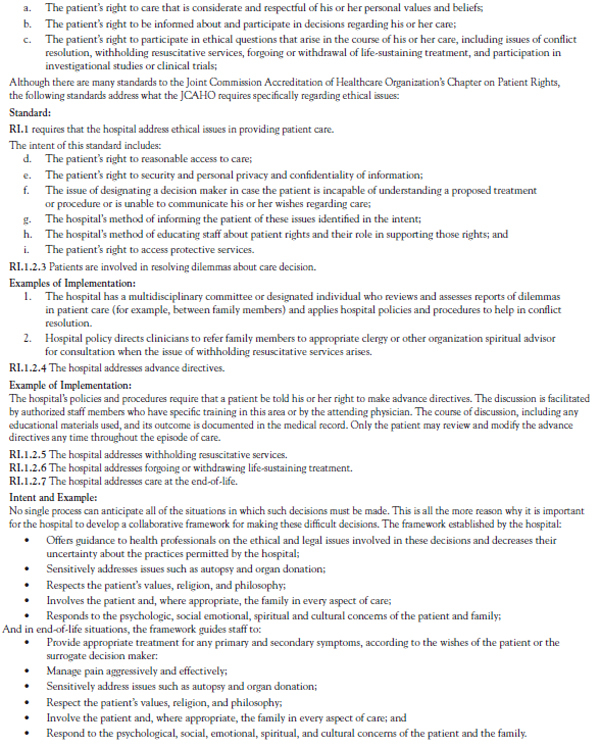 The most common ethical principles involved in healthcare settings today are patient autonomy, beneficence, non-maleficence, fidelity, right-to-know, justice, and veracity (Table 1). Under the deontologic umbrella, an action is deemed right or wrong according to whether it follows pre-established criteria known as imperatives. An imperative in our language is viewed as a "must do," a rule, an absolute, a black and white issue. This is an ethic based upon duty linked to absolute truths set down by specific philosophical schools of thought. As long as the principles dictated by these imperatives are met with dutiful compliance, one is said to be acting ethically . One of the most significant features of deontologic ethics is found in John Rawls' Theory of Justice, which states that every person of equal ability has a right to equal use and application of liberty . However, certain liberties may be at competition with one another. There are also some principles within the same ethical theoretical system that can conflict with one another. An example of this conflict might involve a decision over allocation of scarce resources. Under the principle of justice, all people should receive equal resources (benefits), but allocation can easily become an ethical dilemma when those resources are scarce. The nurse and other health professionals making ethical decisions under the deontologic ethical system see all situations within a similar context regardless of time, location, or people. It does not take into account the context of specific cultures and societies . The terminology used in this system of beliefs is similar to that found in the legal justice system. One differentiation is the enforcement of the rights and duties in the legal system that do not exist in the ethical system. A well-known deontologic ethical theory is based upon religious beliefs and is known as the theologic ethical theory. The principles of this theory promote the summum bonum, or highest good, derived from divine inspiration. A very familiar principle is to do unto others as you would have them do unto you. One would be viewed as ethically sound to follow this principle within this system of beliefs. Another deontologic ethical principle is Immanuel Kant's "Categorical Imperative" . Kant believed that rather than divine inspiration, individuals possessed a special sense that would reveal ethical truth to them. That ethical truth is thought to be inborn and causes humans to act in the proper manner. Some of the ethical principles to come from Kant will become more familiar as the principles associated with bioethics are discussed. These include individual rights, self-determination, keeping promises, privacy, personal responsibility, dignity, and sanctity of life. Utilitarianism is the most well-known teleologic ethical theory. This is the principle that follows the outcome-based belief of actions that provide the greatest good for the greatest number of people . So, rather than individual goodness or rightness, this principle speaks for the group or society as a whole. Social laws in the United States are based upon this principle. The individual interests are secondary to the interest of the group at large. There are two types of utilitarianism: act utilitarianism and rule utilitarianism. In act utilitarianism, the person's situation determines whether an act is right or wrong. In rule utilitarianism, the person's past experiences influence one to greatest good. There are no rules to the game; each situation presents a different set of circumstances. This is also referred to as situational ethics. Situational ethics would say that if the act or decision results in happiness or goodness for the person or persons affected, it would be ethically right. One modern teleologic ethical theory is existentialism. In its pure form, no one is bound by external standards, codes of ethics, laws, or traditions. Individual free will, personal responsibility, and human experience are paramount . Existentialism lends itself to social work because one of the tenets is that every person should be allowed to experience all the world has to offer. A critique of the existential ethical theory is that because it is so intensely personal, it can be difficult for others to follow the reasoning of a healthcare worker, making proof of the ethical decision-making process a concern. Another modern teleologic ethical theory is pragmatism. To the pragmatist, whatever is practical and useful is considered best for both the people who are problem solving and those who are being assisted . This ethical model is mainly concerned with outcomes, and what is considered practical for one situation may not be for another. Pragmatists reject the idea that there can be a universal ethical theory; therefore, their decision-making process may seem inconsistent to those who follow traditional ethical models. An advantage to this system of ethics is that it is enmeshed in the philosophies of some of the better known nurse theorists, such as Dorothea Orem and Sister Callista Roy, in regard to human development and healthcare goals of reaching an individual's maximum potential [27,28]. Although appearing to be the perfect approach to all ethical situations requiring decision making, there are some significant drawbacks; for example, a person's maximum potential is relative or subjective. Additionally, what constitutes natural law? The precept to do good and avoid evil leaves a very large space for interpretation. Because it acts largely outside individual wishes, often separating human life into a set of separate events, it is an impersonal approach, devaluing the focus on dignity. To some, it is also a rather cold-hearted approach—not making decisions with an individual, but for the individual based on what others believe to be good for that person. The principle of paternalism would fit within this context. The final ethical theory to be discussed here is the modern ethical system of thought that centers on the diversity of cultures and beliefs. Therefore, at its core, this ethic assumes that all discourse and interaction is transcultural because of the strengths and differences in values and beliefs of groups within society. This concept has been developed into what has become known as the transcultural ethical theory. In the last decade, the ethics of caring has become a specific moral focus of nursing. Attention is being paid to the need for cross-cultural ethical issues in both medicine and nursing. The concept of transcultural nursing was penned by Dr. Madeleine Leininger and focuses on a comparative analysis of differing cultures, health-illness values, patterns, caring behavior, and nursing care . Decisions are made on the basis of the value or worth of someone by the quality of inter-relationships. These differences of values, beliefs, or ethical principles are present in healthcare environments. They are much more pronounced when the individuals' values differ greatly from those of the healthcare professionals who care for them. This system of ethics is a holistic framework, built around a model of interrelated precepts: transcultural caring dynamics, principles, transcultural context, and universal source. These precepts form the foundation for facilitating the transcultural ethical decision making (Figure 2). The advantage to the transcultural ethical system is that it folds some of the other ethical systems together while recognizing the differences between people. A disadvantage might be that Western society largely follows the deontologic and teleologic principles that also make up our legal system. Therefore, there may be some difficulty in making decisions based upon other cultural beliefs and values. Our society largely operates on a basis of facts, conclusions, and predetermined, agreed-upon solutions based upon male Anglo-American ideals. Many healthcare professionals may find difficulty with the transcultural ethics reliance on close inter-relationships and mutual sharing of differences required in this framework of ethical decision making. The Hartford Institute for Geriatric Nursing recommends being sensitive to racial, ethnic, religious, and cultural mores and traditions regarding end-of-life care planning, disclosure of information, and care decisions. The ethical theory of relativism/multiculturalism falls under the postmodernist philosophical perspective and may be referred to as moral relativism . Multiculturalism promotes the idea that all cultural groups be treated with respect and equality . According to ethical relativists, ethical principles are culturally bound and one must examine ethical principles within each culture or society . The question then becomes how ethical principles that are primarily deontologic and rooted in Western values are applicable in other societies. The challenge of ethical relativism is how to determine which values take precedent . Greater detail will be focused on multiculturalism and diversity issues later in this course. It is important to remember that ethical theories are just that, theories. They do not provide absolute solutions for every ethical dilemma. They do provide a framework for ethical decision making when adjoined to the critical information nurses gather from patients and families. In reality, most nurses glean from and combine the theoretical principles that fit best for the particular patient situation. Whenever the nurse-patient relationship is established, a moral relationship exists. Though not an inherent gift, moral reasoning is required to reach ethically sound decisions. This is a skill, and moral reasoning must be practiced so that it becomes a part of any healthcare professional's life. Although all ethical systems concern decisions about ethical problems and ethical dilemmas, the decision reached in regard to a specific conflict will vary depending on the system used. For example, a nurse assigned to care for patients in the terminal stages of acquired immune deficiency syndrome (AIDS) might have strong fears about contracting the disease and transmitting it to their spouse and children. Is it ethical to refuse this assignment? A nurse deciding on the basis of utilitarianism would weigh the good of his or her family members against the good of the patient. Based on the greatest good principle, it would be ethical to refuse to care for the patient. In addition, because utilitarianism holds that the ends justify the means, preventing the spread of human immunodeficiency virus (HIV) to the nurse's family would justify refusal of the assignment. Based upon deontology, duty and justice are the underlying and unchanging moral principles to follow in making the decision. A person who becomes a nurse accepts the obligations and duties of the role. Caring for patients with infectious diseases is one of those obligations; therefore, refusal would be a violation of this duty. In this system, another unchanging moral principle, justice, would require healthcare professionals to provide adequate healthcare for all patients. Refusing to care for an AIDS patient would violate this principle. According to the natural law system, refusing to care for an AIDS patient would be unethical. One of the primary goals of the natural law system is to help the person develop to maximum potential. Refusing to care for an AIDS patient would diminish the patient's ability to develop fully. Also, such a refusal might diminish the nurse's skill and emotional development. A good person, by natural law definition, would view the opportunity to care for an AIDS patient as a chance to participate in the overall plan of creation and fulfill a set of ultimate goals. Although such decisions are usually made on a practical, not theoretical, level, at times it is important to be able to relate a decision to its underlying system or principle. To better visualize how ethical dilemmas arise, let us take a look at a real life situation taken from Case Studies in Nursing Ethics regarding the question of whether a patient had a living will or advance directive . Nurse P is a staff nurse in the coronary care unit of a large medical center. One morning he is informed that a patient from the recovery room will soon be admitted to the coronary care unit and assigned to him. The patient, a white man, 67 years of age, with known history of myocardial infarction, also has cancer of the prostate. The initial hospital admission was for a transurethral resection, which had been aborted in the operating room when the patient developed cardiac changes following spinal anesthesia. The patient had been transported to the recovery room with the diagnosis of possible myocardial infarction and was to be transferred to the coronary care unit for management and evaluation. Nurse P heads to the recovery room with a bed to pick up the patient. When he arrives, the patient is being coded. He had apparently gone into ventricular tachycardia/ventricular fibrillation in the recovery room and had required countershock, cardiopulmonary resuscitation (CPR), intubation, lidocaine, and vasopressors to maintain his blood pressure. A Swan-Ganz catheter was put in place. Recovery rhythm was sinus bradycardia to sinus tachycardia with occasional pauses. The patient was acidotic, in pulmonary edema by chest x-ray with an alveolar oxygen partial pressure (PaO2) of 50–60 mm Hg, a fraction of inspired oxygen (FIO2) of 100%. During the events of the code, an attending cardiologist (Dr. D) passed by, observed the code, and made the following statement to the recovery room staff and coronary care unit resident: "Say, that's Mr. S. I know him from his last hospitalization of 1 month ago when I was attending in coronary care unit. I believe he has a living will." While the patient is stabilized, Dr. D calls the patient's relative, who happens to work in another part of the medical center. The relative also expresses the belief that Mr. S has a living will and does not want to receive extraordinary support measures. Dr. D relays this information to the other physicians, and there is general agreement that conservative measures to ensure support are indicated while the living will is located. The coronary care unit resident and Nurse P transport Mr. S to the coronary care unit. When admitted, the patient's systolic blood pressure is 70 mm Hg while on dobutamine 8 mcg/kg and dopamine 26 mcg/kg. The patient occasionally responds to verbal commands, opens his eyes, grips Nurse P's hands, and responds to pain in the upper extremities (his lower extremities are still under the effects of the spinal anesthesia). Cardiac monitoring shows that the patient is still having sinus tachycardia. At this point, the coronary care unit resident and an intern approach Nurse P and inform him that they believe that the present treatment of the patient is cruel. Upon locating old medical records, they learned that the patient had been designated "do not resuscitate" (DNR) on his last admission, and the patient is supposed to have a living will, although it has still not yet been located. They order Nurse P to slowly turn off the intravenous (IV) drip of dopamine and dobutamine. Nurse P is faced with an ethical dilemma. The treatment modalities in Mr. S's treatment plan were basic: IV therapy, medication, and oxygen support. Some people might say the hospital team missed its chance when it failed to act decisively when it might have omitted the resuscitation of this patient. The IV, medication, and oxygen support may have been seen as obligatory for the patient and as supportive care. Two reasons for this position might be offered. First, it might be argued that aggressive resuscitation is extraordinary, whereas an IV drip is ordinary. Another question might be whether the patient saw the IV as serving a purpose any more than the CPR served. Second, the difference between the CPR omission and stopping the IV drip is that one is an omission and the other would be a withdrawal. This raises the question of whether there is a difference between the two. Maintaining such a distinction might incline caregivers to be reluctant to start treatments such as an IV drip. Defenders of the view that there is no legitimate moral difference, believe that it is better to start a treatment when there is doubt about the correctness of the course and then withdraw if the time comes when it is clear that the patient would not have wanted the treatment to continue. Here, however, Nurse P is being told by a resident and intern to turn off the IV drip on the basis of an unconfirmed belief that the patient has a living will and the fact that he reportedly had been designated for nonresuscitation on his last hospital admission. Nurse P must face the question of whether that is sufficient reason to stop the treatment even with the apparent approval of Mr. S's relative. It is likely that the next of kin's judgment would be sufficient in the case where the patient's wishes cannot be determined, but that does not seem to lead to a clear answer here. First, we are not sure if the relative is Mr. S's next of kin. Moreover, even if it is, it seems possible that Mr. S has expressed his own wishes, and those wishes would surely take precedence. While the assumption is that he has a living will, no one seems to know exactly what it says. Some living wills are written for the purpose of insisting that treatment continue. The other possibility is that the living will could have been changed or voided by the patient between hospitalizations. Therefore, any action based on assumptions is taking considerable liberty. Also, any previous DNR order during another hospitalization would not be in effect for the present hospitalization. Again, there is the danger of paternal decision making by physicians and others for the patient . More prudent action here must be considered in the light of the PSDA. Because a living will is thought to exist and a relative was found, no withdrawal in the treatment of Mr. S should occur. The following would be a reasonable and prudent decision making process on behalf of the patient, Mr. S: (1) the living will document should be obtained (there should have been a copy from the last hospitalization, or perhaps in the possession of other family members or with the primary care physician's office); (2) relatives should be notified, and those, by law and policy of the hospital, could consent for continuation or removal of treatment modalities in the absence of an advance directive; and (3) consideration of the patient's wishes and witnessed comments and conversations in the past regarding healthcare decisions to be made for him under specific circumstances should be ascertained, in the absence of an advance directive. Every situation that presents itself may be different, but ethical decision making based on a framework of ethical theories can provide the nurse with useful means for resolving ethical dilemmas in patient care. What happens when, for example, patients are unable to make decisions for any reason? A blending of theoretical ethical systems and principles and a practical framework on which the healthcare professional can help patients and their families make healthcare choices is our next area for discussion. The chief goal of an ethical decision-making framework is to determine right from wrong in situations where clear demarcations do not exist or are not readily apparent to the nurse who is faced with the decision. Nurses must clarify their own values and subscribe to a particular ethical system or theory before an ethical decision-making framework can be used successfully. A framework provides a method for nurses to answer key questions about the dilemma and to organize their thinking in a more logical and clear manner. There are several forms that ethical decision-making frameworks can take. They are all based on the scientific or problem-solving method that forms the basis for the nursing process. The problem-solving model is the basis for the ethical decision-making framework that follows. Although ethical dilemmas and the decision-making skills involved in resolving these dilemmas are complex and multifaceted, mastery of these skills is well within the capability of the healthcare professional. The specialty area of ethical decision making, like most other specialties, has its own language and terminology that must be understood and mastered. However, the science of ethical decision making does not depend on a set of static rules that are unchanging. Ethical decisions are based on a framework of ethics that is dynamic and useful in day-to-day situations. There are many resources to assist nurses as they participate in ethical decision making. The American Nurses Association (ANA) Code of Ethics for Nurses with Interpretive Statements identifies core values of the profession. It offers a guide regarding how nurses should act in ethically problematic situations . The code provides guidance for conduct and nursing responsibilities that are consistent with ethical obligations, quality of care, and the professional conscience. In 2002, the Association of Operating Room Nurses Special Committee on Ethics published an elaboration of the ANA code delineating perioperative nursing examples to the 11 original ANA statements . The nurse as patient-advocate is supported throughout the code. It is important to remember that advocacy implies that the nurse acts as a supporter to advance the interests of the patient, not as the person who makes decisions for the patient. Other resources to assist nurses in ethical decision making are the ANA's Position Statements; the Risk and Responsibility in Providing Nursing Care statement is one example . This statement provides the nurse with guidance in decisions involving the balance between risk and responsibility. Because each nurse will determine his or her own risks, there will be considerable variability within the profession. In determining whether more harm will occur to the nurse than to the patient if care is provided, the statement specified four criteria to assist the nurse in the decision. If the criteria are met, the nurse has an obligation to provide care. If they are not met, the nurse can evaluate his or her personal risk and professional responsibility when deciding whether to provide care. In all, there are 15 position statements published by the ANA on ethics and human rights . Several of these are retired or updated statements, including the 2013 position statement Euthanasia, Assisted Suicide, and Aid in Dying, which supersedes the retired statements Assisted Suicide (1994) and Active Euthanasia (1994). Read and study the ANA Position Statements on Ethics and Human Rights online at http://nursingworld.org/DocumentVault/Ethics-1/Code-of-Ethics-for-Nurses.html. Nurses and other healthcare professionals may also receive ethical guidance from other professional organizations. For example, the Commission for Case Manager Certification publishes the Code of Professional Conduct for Case Managers, which establishes the rules and standards of professional conduct for certified case managers . The basic principles of this Code support the principles of ethical nursing practice, including prioritizing the public’s interest above one’s own, respecting the rights and inherent dignity of all of their patients, maintaining professional boundaries and objectivity, acting with integrity, and maintaining competency. The full Code is available online at https://ccmcertification.org/content/ccm-exam-portal/code-professional-conduct-case-managers. Hospital ethics committees are also a good resource for ethical decision making. Most hospitals have nursing, medical, and/or integrated ethics committees. The purpose of these committees is to develop policy recommendations, educate, and participate in retrospective or prospective case reviews. Another resource is the use of a nursing ethical decision-making model. There are many ethical frameworks for decision making, but they all include the same concepts. Essential elements include collection of information; inclusion of necessary staff and family members; identification of choices and their relationship to the application of ethical principles; projected results of choices; decision making and its implementation; and evaluation of the action's effect on the patient, family, nurse, and significant others. It might be helpful to the healthcare professional to have a preliminary understanding of how to set up a workable ethical decision-making framework. The nurse can then support the patient and family through a step-by-step process. In their professions, nurses and physicians are frequently taught to apply very strict standards in the determination of patient capacity or ability to make decisions. A framework for ethical decision making presupposes that nurses and physicians making decisions know that a system of ethics exists, the content of that ethical system, and that the system applies to similar decision-making problems despite the multiple variables. As an example, many institutions have adopted policies that do not allow a medicated patient to sign consent forms within a specified time. But the chronic pain management patient on continuous narcotic pain control may not have the capacity of reason. Whenever possible, the patient/family makes the final healthcare decision. The first and most important step is to gather and assess the facts. The nurse can be instrumental in facilitating the stages of ethical action. The following is a general outline of each step and process that develops as one moves through the steps. In each step, questions are offered to help the healthcare professional gather all the information necessary to assist the patient and healthcare team in the decision-making process. Create an atmosphere of caring as you deliberate. Identify those involved with the ethical dilemma and involve them in the decision making when appropriate. Listen to their remarks before you proceed. Has the patient had time to reflect on the situation and on the possible options? Are there hospital policies or guidelines that apply and would be helpful in this situation? Naming the dilemma involves identifying the values in conflict. If they are not ethical values or principles, it is not truly an ethical dilemma. It may be a communication problem or an administrative or legal uncertainty. The values, rights, duties, or ethical principles in conflict should be evident, and the dilemma should be named (e.g., this is a case of conflict between patient autonomy and doing good for the patient). This might happen when a patient refuses an intervention or treatment that the nurse thinks would benefit the patient. When principles conflict, such as those in the example statement above, a choice must be made about which principle should be honored. Most healthcare facilities have a mechanism in place to assist their staff and patients in making ethical decisions. Generally, guidelines or policies are written to address these ethical issues. In some cases, decision trees (algorithms) are used because they are easy for the user to follow in any given situation. 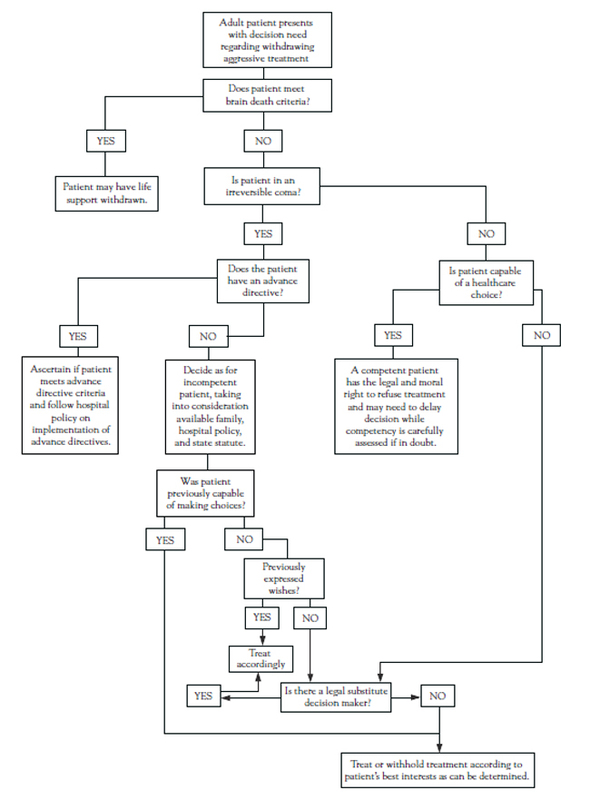 An example of a decision tree is given in Figure 3, regarding withdrawal of life-sustaining treatment. This algorithm approach may be used by any facility in guiding healthcare professionals and patients through an ethical decision specific to a particular ethical problem or, more generally, for making any ethical decisions. Ethical decision making is to be done with objectivity. However, there is a psychologic side to decision making as well. The next section alerts us to the fact that we make decisions based on many factors, and we must be aware of them so that we better understand our thinking process and why we make decisions the way we do. Psychologists have looked at many of the same questions that philosophers have pondered, but from their own professional perspective. Psychologists' theories of moral development provide insight into how moral disagreements develop and even how we may untangle them. Harvard scholar Lawrence Kohlberg is considered the preeminent moral-development theorist, but his thinking grew out of Jean Piaget's writings on children's intellectual development . His theories are descriptive rather than proven facts. Others in this field have taken issue with his categories, saying they are based too exclusively on rights-oriented ethical approaches, particularly those based on responsibility for others. Stage 6: At this final stage decisions are justified by appeals to personal conscience and universal ethical principles. It is important to understand that Kohlberg's stages do not help to find the right answers, as do ethical theories. Instead, recognizing these stages help us to know how people arrive at decisions. As a result, if the same question was asked of someone at each of the six levels, the answer might be the same in all cases, but the rationale for the decision may be different. For example, let us suppose we are caring for a terminally ill man in great pain who is asking the doctor or the nurse for enough barbiturates to commit suicide. Here are examples of the rationale for the healthcare professional's decision and reply in each stage. Stage 1: "No, because I could lose my license if anybody found out I had done that." Stage 2: "No, because if I became known as a doctor or nurse who did that kind of thing, other doctors and nurses might not refer patients to me." Stage 3: "No, because that is against the law and professionals should obey the law," or "No, because my colleagues would no longer respect me if they knew I had done that." Stage 4: "No, because if everyone did that, the doctors and nurses would no longer be trusted to save lives." Stage 5: "No, even though the patient might suffer less, we need to be faithful to our respect for life because otherwise we might lose our standards and abuse our authority." Stage 6: "No, because I personally believe that no one has a right to take his or her own life, and so I cannot be a party to such an action." Again, the stages do not determine the decision itself. A set of yes answers could as readily be written for each stage. For example, stage one "yes" reasoning might argue that if the patient continues to live, he is only going to make life miserable for all of the staff. A stage two decision to provide help with the suicide is justified because the patient was paying for technical advice; therefore, the doctor or nurse ought to provide help to him or her, as long as the patient was not asking the healthcare provider to cause his or her death directly. A stage five thinker might argue that no one benefits from keeping individuals alive longer than they want to live, and a stage six answer might be that the decision to exit life is a serious one that should be honored if it is made reasonably. These stages can give the healthcare professional another viewpoint as to how ethical decisions can become complicated. A person who is capable of stage four reasoning may be reasoning at any level below that, but he or she will be stymied by someone who is trying to use a stage six argument. Ideally then, if discussion is to be effective or bring about consensus or agreement, the participants in that discussion should be talking on the same level of ethical discourse. Whenever individuals gather to address a particular patient's case, the members of the team must be sure that they are clear about what values they hold, both individually and as a group, and where the conflict lies. Effort should be made to determine if the conflict has arisen based on a single ethical system's precepts or between the values, principles, or rules that belong to different ethical systems. When consensus has been reached, the members should be aware of the stage level of the decision. Ethical decision making should not be made using stages two or three reasoning for the critical issues facing healthcare professionals. Stages five and six are more appropriate for the level of decision making required in our society. Every profession that deals with human rights and liberties eventually develops professional ethics (either formally or informally) to guide the responsible behavior of its members. In healthcare, the deductive process by which ethical principles are applied to situations common to the profession is called bioethics. It is a branch of applied ethical theory at least as old as the Hippocratic Oath and as current as the dilemmas posed by the unique clinical practice of today. Swearing obedience to the truths of his time, Hippocrates pledged to use treatment to help the sick according to his ability and judgment, but never with a view to injury and wrongdoing. The two most influential principles in deontologic bioethics are: non-maleficence, the imperative to do no harm, and beneficence, the view that the right action is that which promotes a greater good for the patient as that good is understood by the professional. Fundamental to bioethics, these two principles seem straightforward and apparent. Yet on closer analysis, both become more complex. Non-maleficence allows no place for a variety of treatments under debate today: abortion, refusal of extreme life-sustaining measures, and removal of organs or tissues from living donors are all directly affected. Similarly, if beneficence is strictly observed, the patient's well-being is the sole criterion for a good outcome, seemingly despite the cost to the patient's family, hospital staff, society, or the healthcare system. As a philosophy for nursing, both non-maleficence and beneficence stress the importance of cooperation with the care-providing network, especially physicians and healthcare institutions, as the source of the definition of good or harm to the patient. These principles set the physician as the bearer of moral agency or having the right and the power to make ethical decisions about a person's care. The patient's own self-determination is less important here. In fact, in the service of these ethical imperatives, therapeutic lies (i.e., withheld information) might be rationalized as more beneficial to a patient than their human rights—their right to know. Modern nursing theory has begun to organize alternatives to the Hippocratic Oath and its deontologic ethic. Rather than placing moral agency and the definition and responsibility of a patient's well-being solely in the hands of the professional caregiver, nursing attempts to work out an ethical system by which patients can play a more important role in decisions about their own health—to assume moral agency. Another approach to delivering healthcare has evolved based on another guiding principle: autonomy. Autonomy espouses the personal rights and self-determination of patients. Such decisions about treatment are freely made, are informed and carefully thought out, and do not endanger others. How this is done requires yet another decision about the ethical nature of nursing as a profession. How can nurses best assist patients to make decisions and exercise self-determination? Paternalism sees the nurse urging patients to choose treatment plans based on the physician's idea of best interest. Paternalism is the view that professionals understand the patient's best interest better than the patient and are entitled to act so that a patient's well-being is promoted, even if the patient does not agree. In certain cases, individual liberties might be compromised in favor of the superior judgment of healthcare workers. Consumerism obligates the nurse to act as a kind of consumer's guide, communicating the objective facts of the patient's condition and the details of various treatment options. The nurse then withdraws, leaving the decision entirely to the patient. Advocacy is something of a compromise between paternalism and consumerism and has been very useful for nursing. It has been defined as the active assistance to patients in their self-determination concerning health alternatives. It is the effort to help patients become clear about what they want in a situation, to assist them in discerning and clarifying their values and examining available options in light of those values. During the process of advocacy nursing, it is essential that nurses first help clarify the patient's own belief value systems as they relate to making decisions about their own care. Crowley points out in her essay "Feminist Pedagogy: Nurturing the Ethical Ideal," the nurse's own ethical principles must also come into play as well, so that a two-way, patient-centered conversation can occur between patient and nurse, allowing more human and holistic decisions to be made by the patient . This sharing of beliefs between patient and nurse is the ethics of caring as proposed in the holistic nature of nursing. Caring allows the nurse more of an involved role than consumerism, as nurses and patients share, rather than enforce, their different convictions about life and death. At the same time, caring stops short of paternalism in that the nurse merely illustrates how to make an ethical decision by applying her own ethical principles. The primary goal is to empower the patient to make his or her own decision. It is essential that the nurse be able to understand her own ethical systems and to place those of her patient within proper perspective, even if they are different from her own, all without being judgmental. In this way, the ethics of caring makes clear how ethical decision making has become so central for nursing. In many hospitals, long-term care, and hospice care agencies, the most often used principles that conflict are patient autonomy and physician paternalism. As noted, patients historically deferred to the physicians' judgment about the type and extent of medical care appropriate for them. More recently, this paternalistic approach to healthcare decision making has been replaced with a model that emphasizes patient autonomy and, therefore, the right of the individual to participate in and make the final decision for his or her healthcare treatment. Patient M, a woman, 34 years of age, is in critical condition and is scheduled for emergency surgery following a severe motor vehicle accident. You have been informed that her two children have been killed in the crash. She is almost hysterical and is asking you repeatedly about the condition of her children as you prepare her for emergency surgery. Do you tell the mother the truth about her children at this time or wait until after the surgery? The ethical principles involved are beneficence and veracity (i.e., doing what is in your patient's best interest and telling the truth) and to a certain extent non-maleficence. This is an emotional issue, as most ethical dilemmas are, so be careful not to get into the "what if" trap (e.g., "What if Patient M were not in a critical condition, but was still facing surgery," or, "What if this woman was a close friend or family member?"). Remain as objective as possible when gathering facts and assessing the information and do not let emotions cause altered behavior. Other considerations are personal values. Telling the truth is a concept that varies substantially between individuals. Personal views on absolute versus situational ethical reasoning will also affect the decision-making process and, perhaps, the definition of and decision-making use of the veracity principle. It is also very important to remember that there are other healthcare professionals to assist in the dilemma and help make a collaborative decision. The other major consideration is knowing your hospital's policies in regard to deciding ethical issues. The ground work should be there for you, and you should be familiar with it. If your workplace does not have policies that address making ethical decisions, you may want to refer to the suggested Guidelines for Ethical Decision Making in Patient Care, included later in this course. It may be helpful for your use and can be adapted to fit your institution. When developing policy of any kind, it is important to research the state statutes that apply to the agency policy information, ensuring that it is in sync with the law. Also, use the community's similar agencies as resources. Find out if they have similar policies or guidelines that they would be willing to share. Most facilities are willing to share this kind of information. Use your own agency resources; a risk manager, ethics consultant, or ethics committee can be very helpful. The following is an example of a policy for ethical decision making in patient care that can be used and/or adapted for your agency's use. This policy is an example that addresses the scope of ethical decision-making that meets the Joint Commission standards, the PSDA, and institutional policies. The author recognizes that the institution and the people who will be named as resources and who will be the identified initiators of the process for decision making may be different in your agency. This policy also addresses a mechanism for educating the community and healthcare professionals that meet the federal and state regulations, but may be different in various institutions. Healthcare policy formats vary from one institution to the next. Check with your agency's policy manual to see which format they prefer. Whatever the format, the components of your ethical decision-making policy guideline should include what is exemplified in the following policy. It is the policy of (facility name) to provide patient care within an ethical framework established by its healthcare professionals, the law, and by the healthcare organization itself. Each healthcare professional has an obligation to respect the voice of the patient or his/her designated representative when ethical issues arise during the patient's care. Further, (agency or type) will provide its patients or designated representatives and health professionals a mechanism to participate in ethical decision making. Every person with actual or potential health problems deserves ethical care and treatment characterized by respect for human dignity, recognizing the uniqueness of the patient and his/her values, and unrestricted by consideration of socioeconomic status, personal attributes, age, gender identity, religion, or the nature of the health problem. The interdisciplinary team's decisions and activities on behalf of the patient are in keeping with personal and professional codes of ethics and in accord with legal statutes and institutional policy. Using the institution's codes of ethics as a primary guideline, the healthcare team must be alert to the patient's special ethical considerations and, further, to act in an advocacy role in the patient's behalf. The Hartford Institute for Geriatric Nursing asserts that nurses should be aware of which professional in their agency/institution is responsible for checking with the patient that copies of the advance directive have been given to their primary healthcare provider(s) and their proxy and that the patient is carrying a wallet-size card with the advance directive and contact information. In all situations, the interdisciplinary patient care team is encouraged to use the following guidelines to assist them in their decision-making process. Systematically examine his or her knowledge base, attitudes, and behavior in light of ethical standards for the provision of care to patients. This should be an ongoing process that is addressed by keeping current on new laws and policies and professional codes dealing with ethical issues and patient rights, examining the team member's own values, attitudes, and spiritual beliefs. Explore ethical aspects of the care of the patient with the patient, his or her family, peers, and professional colleagues as appropriate in order to promote sensitivity to the rights and dignity of the patient. Input from members of the patient's family and from the staff is viewed as a valuable contribution to the patient's plan of care. It is always appropriate and highly encouraged to include the patient and his/her family (whenever possible) in all discussions of the care of the patient, especially those involving ethical issues. Each patient care team member should be aware of the possible ethical issues that can arise in any patient's care. For those patients who face life-threatening situations as a result of an emergency, or for those entering an end-stage disease process, each patient or designated representative should be given an opportunity to discuss and decide what treatment he or she will accept or refuse. Continue to include the patient and family in the patient's plan of care. Discussion of the patient's feelings about his or her condition, treatment, values, and spiritual, psychosocial, and cultural beliefs should be encouraged to assist the individual nurse and other members of the patient's healthcare team to provide the best care for the patient. It should be determined whether there exists a communication breakdown. Any information obtained should be considered confidential to all except those involved directly in the care of the patient. Documentation of information obtained should be placed in the patient's record, the primary medical provider shall be notified, and any resulting orders obtained and recorded. If no conflict arises between the patient's wishes and those of the healthcare team members involved in the care of the patient, and the patient's requests are legally sanctioned by state and federal law and within institutional policy guidelines (i.e., through the patient's advance directive), the patient's wishes shall be followed. If an ethical conflict arises involving a patient, the nurse (or administrative person) in charge of the patient's care shall identify the ethical problem and the persons at conflict (e.g., patient and physician, patient and family, family and physician, or any combination of persons directly involved in the patient's care). If the person who reports the conflict is the patient, the nurse should initiate a discussion with the patient to identify the problem to determine if the conflict involves anyone other than the patient. If information, including patient's rights, is all that is requested, the nurse should discuss the issues with the patient and family (if available) and document the patient's wishes in the medical record. The physician shall be notified of such, and any resulting physician orders shall be obtained and documented. If the conflict involves a patient and physician, the nurse shall attempt to encourage discussion between the patient and family to ascertain their feelings and call the physician to obtain a response to the patient's wishes and concerns. All discussion with the patient and physician shall be documented. The nurse in charge of the patient's care shall discuss the conflict with the manager (supervisor or administrator) for collaboration. Unit staff meetings may be utilized as a discussion base and education about ethical conflicts that may arise on the individual unit. If any of these situations warrant immediate results (e.g., the patient is facing imminent death), the conflict should immediately be reported to the primary physician and/or administrator charged with the final determination of action in ethical matters (e.g., Chief of Medical Staff for physician issues, Institutional Ethics Committee Chairperson or members, Risk Manager). Healthcare team members should always keep in mind that if the patient is competent and able to speak, the patient has the right to accept or refuse care, and his or her wishes are protected by state statutes and hospital policies that address these rights. Under other, non-life-threatening or nonemergent situations where a conflict remains unresolved after unsuccessful attempts at resolution, the matter should then be referred to the institution's ethics committee (or other agency, designated person, or groups). In-facility television programming will offer patients and staff ongoing video presentations on a patient's right to formulate an advance directive. Computer-based learning programs on ethical issues will be made available on the hospital computer network. In-facility workshops will be provided at least once a year to staff members regarding education on patient's rights and ethical issues. Annually, a workshop for the lay community will focus on patient rights and ethical issues. Annually, a community-wide workshop for healthcare professionals will focus on patient rights and ethical issues. The following case study scenarios have been chosen to give the reader an opportunity to address a variety of ethical issues that may arise in various environments. This is done to show the participant that the ethical decision-making process is similar in all cases. However, the process can take many forms, depending on the formats used by an individual or group. Yet, all the steps come to a rational thinking process that is at the base of nursing. The first case study comes from an article by Kokiko and Watts entitled "Ethical Decision Making in the Emergency Department: The R.O.L.E. Acronym for Four Areas of Consideration" . Patient J, a man 35 years of age, was involved in a fight and sustained a large laceration to the center of his forehead. The patient presents to the emergency department alert and oriented without significant findings other than the 10-cm laceration. However, his speech is slurred, and he readily admits to drinking 10 beers during the last few hours. The emergency department is very busy with more urgent cases, and the patient becomes impatient because of the wait. Patient J wishes to leave, but is urged by the ED staff to wait and is told that he should not drive. He is clearly lucid and states that he will not wait any longer and intends to drive himself home. Using the acronym R.O.L.E. as their framework, note that the authors identify the same decision-making issues as the framework and algorithm examples discussed in this course. R: Risks of medical treatment. In this case the proposed treatment bears little risk to the patient. Few people have life-threatening complications from laceration repair; therefore, the chance of the patient experiencing untoward harm from the procedure is remote. O: Opinion of the patient. Why does the patient want to leave the emergency department? Does he understand the risks and benefits of the procedure? Is he competent to make this decision in his intoxicated state? L: Life quality. Will not having the laceration repaired significantly affect the patient's quality of life? Would an unsutured wound healing for an extended period affect the patient in his profession and render him unable to earn a living? For example, would he be unable to wear required safety equipment, such as a helmet or goggles, because of the laceration? Is the patient involved in a profession, such as acting, where a potentially disfiguring scar could affect his career? E: External factors. Is there any obligation on the part of the healthcare team to third parties (i.e., those who may be traveling at the same time as the patient and who may be endangered from a safety standpoint)? The conflict in this case is between the patient's right to autonomy and self-determination and the staff's concern for his well-being and the safety of others. From both a legal and ethical standpoint, competent adults have the right to decide whether they will accept medical treatment. This right relates to the ethical principle of autonomy and the legal doctrine of informed consent. In their professional education, nurses and physicians are frequently taught to apply very strict standards in the determination of patient capacity or the ability to make decisions. There is not allowance for medicated patients to sign consent forms, and frequently, it is assumed that developmentally disabled, intoxicated, and critically ill patients lack the capacity for decision making. In the emergency setting, in particular, there is a bias toward intervention and treatment if there is any doubt about patient capacity. The patient can understand information relevant to the decision at hand. The patient can interact and communicate with caregivers about the decision. The patient can weigh the possible alternatives. Given these guidelines, Patient J was clearly capable of refusing medical treatment, despite the feelings of the ED staff about the necessity of suturing the wound. But what about the third parties who may be affected by Patient J's decision to drive while intoxicated? Do the healthcare professionals have a duty to prevent him from driving? In instances such as these, care providers must remember that their first duty is to the patient. A decision to violate patient confidentiality or to detain the patient against his will automatically places the caregivers in a position that may require justification of actions. If the patient is clearly too intoxicated to drive, a prudent course of action would be to document that the patient was asked to stay and that he was advised that if he chose to leave, his license plate number would be given to the police. Always check the policies and procedures, guidelines, and protocols in your facility to see what resources and assistance you have in these situations. You are a nurse on a pediatric unit. One of your patients is a girl, 15 months of age, with a diagnosis of failure to thrive. The mother has stated that the child appears emotional, cries a lot, and does not like to be held. You have been taking care of the infant for the two days since her admission, and she has smiled and laughed and held out her arms to everyone. She has eaten well. There is something about the child's reaction to the mother's boyfriend that bothers you. The child appears to draw away from him when he visits. The mother is very young and seems to be rather immature, but appears to care for the child. This is the second hospital admission for this child. Although you were not on duty for the first admission six weeks ago, you check the records and see that the child was admitted with the same diagnosis. While you are on duty today, the child's father calls and inquires about her condition. He lives several hundred miles away and requests that the child be hospitalized until the weekend (it is Wednesday) so that he can "check things out." He tells you that he feels the child is mistreated. He says he is also concerned about his ex-wife's four-year-old child from another marriage and is attempting to gain custody of that child in addition to his own child. From what little the father said, you are aware that the divorce was very bitter and that the mother has full custody. You talk with the physician at length. He says that after the last hospitalization he requested that the community health agency call on the family. Their subsequent report to him was that the 4-year-old appeared happy and well and that the 15-month-old appeared clean, although underweight. There was no evidence to suggest child abuse. However, the community health agency plans to continue following the children. He says the mother has been good about keeping doctor appointments and has kept the children's immunizations up to date. The pediatrician proceeds to write an order for discharge. He says that although he also feels somewhat uneasy, continued hospitalization is not justified and the state medical aid will not pay for the additional days. When the mother and her boyfriend come to pick her up, the baby clings to you and refuses to go to the boyfriend. She is also very reluctant to go to the mother. All during the discharge you are extremely uneasy. When you see the car drive away, you feel very sad. What should you do? Upon returning to the unit, you talk with your supervisor, who listens carefully and questions you at length. Finally she says, "It seems as if you have nothing concrete to act upon and are only experiencing feelings. I think you would be risking a lot of trouble for yourself and the hospital if you acted rashly at this time. Accusing people with no evidence and making them go through a traumatic experience is something I would hesitate to do." You leave the supervisor's office still troubled. She did not tell you that you must do nothing, but you feel she would disapprove of further action on your part. The doctor also felt strongly that there was no reason to do more than was already being done. The child will be followed by community health nurses. Perhaps the disgruntled ex-husband was just trying to make trouble for his ex-wife and her new boyfriend. You would certainly not want anyone to have reported you or created problems regarding your own children. You remember how often your 5-year-old bruised himself when he was that age. He often looked like an abused child. You go about your duties and try to shake off your feeling. If the pediatrician had not yet alerted the community health nurses or another child welfare agency, this option might have been taken by the nurse. She had reasonable suspicion given the child's reaction, underweight condition and ex-husband's concern. A call would not have been inappropriate. However, this action had already been taken. The child had no other signs that she was an abused child or that she was in danger of being abused. The nurse in this situation was going on strong feelings, but little evidence. From the Journal of Nursing Administration, we find a case to study regarding the public and professional responsibility of hospitals . Hospitals throughout the country are held in high esteem within their communities for public service. They earn the public's trust by providing safe, good quality patient care. Many community hospitals serve as teaching sites for students' practicum programs, as did the hospital in this case study. Health facilities also have an obligation to share the responsibility for the quality of the nursing program by providing practice sites and nursing role models. In the case presented, the hospital should have been more proactive in addressing the quality of this practice issue. MW is a senior nursing student at a local university. The university's nursing program requires a 200 hour practicum be completed six weeks before graduation. MW chose the intensive care unit (ICU) at a community hospital for her practicum site. MW contracted with one of the ICU staff nurses to serve as her preceptor for the six-week time period. The nurse preceptor is responsible for assisting MW to meet the course objectives. MW, the nurse preceptor, and the nursing instructor met before the practicum to discuss course objectives and expectations. During the six weeks, MW was assigned to work the same schedule as the nurse preceptor, which was the night shift. Within the first week, the nurse preceptor reported to the ICU nurse manager that MW had displayed some inappropriate behaviors. These behaviors included inappropriate dress for work, an arrogant attitude toward the staff nurses, and considerable discussion about the amount of money MW would make as a nurse. The nurse manager and nurse preceptor discussed these issues with MW, and the behaviors improved somewhat. By the end of the second week, the nurse preceptor reported another disturbing incident to the nurse manager. During the previous shift, MW and the nurse preceptor cared for a peritoneal dialysis patient. The nurse had explained the dialysis process to MW, and MW assisted with some of the procedure. After one of the dialysis exchanges, MW was instructed to empty and measure the dialysate output. Under the nurse preceptor's supervision, MW completed this procedure. MW and the nurse preceptor concurred that the amount of fluid removed from the patient was 1,400 cc. MW was given the responsibility of recording the amount on the dialysis flow record. At the end of the shift, when intake and output was being calculated, the nurse preceptor noticed that the amount of dialysate fluid recorded by MW was 1,000 cc. When questioned about the discrepancy, MW responded that the recorded 1,000 cc amount was similar to the amounts recorded by other nurses. The nurse preceptor explained that the dialysate had been changed for the purpose of removing more fluid; thus, a greater amount of dialysate output was desired and expected from this dialysis exchange. MW stated that she did not want her recorded amount to be dramatically different from other recorded amounts. The nurse preceptor reinforced the reasoning behind the dialysis orders and that the actual amount removed is what needed to be recorded. When MW did not correct the dialysis flow record, the nurse preceptor recorded the actual dialysate output. The nurse manager documented the incident and contacted the nursing instructor. The nurse manager informed the nursing instructor that MW's practicum in the ICU was terminated, and she would not be allowed to return to the ICU. The nurse manager requested that the incident be reviewed by the university's nursing program before MW continued the program. The nursing instructor discussed the incident with MW. Later, the nursing instructor told the ICU nurse manager: "The incident does not appear to be serious. MW is completing her practicum requirement at another hospital and is doing great. She will be graduating with her class." Following this conversation, the ICU nurse manager discussed the incident with the hospital's director of nursing and sent a letter to the dean of nursing at the university documenting her concerns about MW's performance. The nurse manager never received a response to this letter. MW went on to another ICU clinical site to continue her practicum. When the nurse manager at the new facility was alerted to the previous incident, she monitored MW closely. She and the charge nurse of the ICU unit found similar inaccuracies in documentation. Further, documentation was made for vital signs by MW. However, she was observed during one shift to have not taken a blood pressure cuff or thermometer into any of her patient rooms. When the charge nurse took her own vital signs on the patients, none matched the documentation of MW. When approached, MW indicated that "vital signs don't change much in four hours and probably don't need to be monitored that often." When questioned about the vital signs she had recorded, MW stated, "I don't want my charting to stand out and be different. None of my patients have been harmed, so I don't see what the problem is." MW was terminated from this practicum site as well and told she could not apply for a position there after graduation. The ethical decision-making model outlined in this course can be helpful. First, name the dilemma. The nurse is violating several ethical principles in this situation: beneficence, the duty to do good; non-maleficence, the duty to cause no harm; veracity, the duty to tell the truth; and respect for persons, the duty to honor the responsibilities of her position and to care for patients without bias, in this case, without regard for how she imagines she will be perceived. Second, sort the issues. MW is displaying both unethical and illegal behaviors. She is falsifying patient information and potentially endangering her patients while disregarding her responsibilities. The nurse has shown that she values fitting-in over gathering accurate patient information. Third, solve the problem. Ethical considerations and recommendations would include the reporting by the hospital to the school of nursing. The hospital should formally address concerns to the division director, dean of the school of nursing, and/or the governing board and request a written follow-up on the findings and actions of the investigation. The hospital should also investigate its State Nursing Practice Act and regulations relative to the governance of a student nurse's role. The hospital should obtain an understanding of the responsibility and accountability of the nursing faculty as well as the hospital's and staff nurse's role in this incident. The hospital should then seek and follow the advice of the State Board of Nurse Examiners. Specific actions to withhold the student's prospective licensure should not be sought unless required by the State Nursing Practice Act. Fourth, take action. The hospital has an ethical responsibility to review the case in whatever forum its policy specifies. In many organizations, the hospital nursing leadership group is the forum. After the problem has been identified and reviewed with the individual, a probationary period should be given for the student's performance to improve. In this case, MW was counseled by the nurse preceptor in the first ICU practicum site. The school should have used the second practicum site as the probationary review. This was not done. Only the clinical nurses were aware of MW's move to another unit, and they began to evaluate her performance there. The school should have been a part of the process. Because this practice standard violation involved a student, a member of the school's faculty was included in the review. During the practice review process, the name of the individual must be disclosed and a determination made whether the practice violation is serious enough to warrant the student's suspension from clinical practice pending a complete investigation. Whatever the outcome, the contractual agreement between the hospital and the school should be reviewed to clarify guidelines. The decision makers must choose which course of action they feel best meets the particular situation and implement. Given the circumstances in this instance, termination of employment was deemed to be the most appropriate course of action. Fifth, evaluate and reflect on the action. Time must be taken in re-evaluating with all parties involved how the decision-making process was handled. One question to be asked by the reviewers is: "Given what we know now, would we make the same decision today that we made then?" In this particular case scenario, and in any similar to it, as professionals, nurses have an obligation to act truthfully and to protect the patients (veracity and beneficence). Nurse leaders have an obligation to investigate practice concern and take the appropriate steps to correct practice problems of any nursing employee or student. This decision is absolutely justifiable. Ethical theory is complicated, and its application is challenging. Many healthcare professionals, particularly nurses, believe that greater information and skills are required to master the many new technologies they use daily. In the specialty healthcare settings, nurses often confront ethical dilemmas. Without a background of knowledge and understanding, they will be unable to make sound decisions about these ethical problems and unable to help patients and families in their decision making. Furthermore, ethical dilemmas are just as serious and important as the physiologic dilemmas nurses face and could be an underlying factor in some physiologic problems. Although every situation differs, ethical decision making based on ethical theories and frameworks can provide a useful means for solving problems related to patient care situations. It is the goal of this course to allow professionals to feel more prepared and confident in facing future ethical decision-making situations in their careers. 1. The Hastings Center. Available at http://www.thehastingscenter.org. Last accessed January 11, 2017. 2. The Kenney Institute of Ethics. Available at https://kennedyinstitute.georgetown.edu. Last accessed January 11, 2017. 4. HHS.gov. Office of the Secretary: Ethical Principles and Guidelines for the Protection of Human Subjects of Research: The National Commission for the Protection of Human Subjects of Biomedical and Behavioral Research. Available at https://www.hhs.gov/ohrp/regulations-and-policy/belmont-report. Last accessed January 11, 2017. 5. Monette DR, Sullivan TJ, DeJong CR. Applied Social Research: A Tool for Human Services. 9th ed. Belmont, CA: Brooks/Cole, Cengage Learning; 2014. 6. Disability Justice. The Closing of Willowbrook. Available at http://disabilityjustice.org/the-closing-of-willowbrook. Last accessed January 11, 2017. 7. American Society for Bioethics and Humanities. ASBH History. Available at http://asbh.org/about/history. Last accessed January 11, 2017. 8. Presidential Commission for the Study of Bioethical Issues. History of Bioethics Commissions. Available at https://bioethicsarchive.georgetown.edu/pcsbi/history.html. Last accessed January 30, 2017. 9. 9. In re Quinlan, 70 N.J. 10, 355 A.2d 647, 1976. 10. Malcolm AH. Judge Allows Feeding Tube Removal. Available at http://www.nytimes.com/1990/12/15/us/judge-allows-feeding-tube-removal.html. Last accessed January 11, 2017. 11. Authority: Secs. 1102, 1861. 1864. 1866. 1867, and 1871 of the Social Security Act (42 USC 1302.1395x. 1395aa. 1395cc. 1395dd. and 1395hh) and sec. 602 (k) of Pub. L. 9621 (42 USC 1395ww note). 12. FindLaw. The Definition of Power of Attorney, Living Will and Advance Directives. Available at http://estate.findlaw.com/living-will/the-definition-of-power-of-attorney-living-will-and-advance.html. Last accessed January 11, 2017. 13. The Joint Commission. 2017 Comprehensive Accreditation Manual for Hospitals. Oakbrook Terrace, IL: Joint Commission Resources; 2016. 14. Joint Commission on Accreditation of Healthcare Facilities. Comprehensive Accreditation Manual for Hospitals: The Official Handbook. Oakbrook Terrace, IL: Joint Commission Resources; 2008. 15. Corey G, Corey MS, Corey C, Callanan P. Issues and Ethics in the Helping Professions. 9th ed. Stanford, CT: Cengage Learning; 2015. 16. Gladding ST. Counseling: A Comprehensive Profession. 6th ed. Upper Saddle River, NJ: Pearson; 2008. 17. Hamblet JL. Ethics and the pediatric perioperative nurse. Todays OR Nurse. 1994;16(2):15-21. 18. Stanford Encyclopedia of Philosophy. Deontological Ethics. Available at https://plato.stanford.edu/entries/ethics-deontological. Last accessed January 11, 2017. 19. Stanford Encyclopedia of Philosophy. John Rawls. Available at https://plato.stanford.edu/entries/rawls. Last accessed January 11, 2017. 20. Catalano JT. Critical care nurses and ethical dilemmas. Crit Care Nurse. 1991;11(1):20-25. 21. Harper MG. Ethical multiculturalism: an evolutionary concept analysis. ANS Adv Nurs Sci. 2006;29(2):110-124. 22. Stanford Encyclopedia of Philosophy. Kant's Moral Philosophy. Available at https://plato.stanford.edu/entries/kant-moral. Last accessed January 11, 2017. 23. Congress EP. Social Work Values and Ethics: Identifying and Resolving Professional Dilemmas. Chicago, IL: Nelson-Hall; 1999. 24. Stanford Encyclopedia of Philosophy. The History of Utilitarianism. Available at https://plato.stanford.edu/entries/utilitarianism-history. Last accessed January 11, 2017. 25. Stanford Encyclopedia of Philosophy. Existentialism. Available at https://plato.stanford.edu/entries/existentialism. Last accessed January 11, 2017. 26. Stanford Encyclopedia of Philosophy. Pragmatism. Available at https://plato.stanford.edu/entries/pragmatism. Last accessed January 11, 2017. 27. Theoretical Foundations of Nursing. Dorothea E. Orem. Available at http://nursingtheories.weebly.com/dorothea-e-orem.html. Last accessed January 11, 2017. 28. Theoretical Foundations of Nursing. Sister Callista Roy. Available at http://nursingtheories.weebly.com/sister-callista-roy.html. Last accessed January 11, 2017. 29. Transcultural Nursing Society. Available at http://www.tcns.org. Last accessed January 11, 2017. 30. Schroeter K. Ethics in perioperative practice: principles and applications. AORN J. 2002;75(4):818-824. 31. Pence T, Cantrall J (eds). Ethics in Nursing: An Anthology. New York, NY: National League for Nursing; 1990. 32. Macklin R. Ethical relativism in a multicultural society. Kennedy Inst Ethics J. 1998;8(1):1-22. 33. Fry ST, Veatch RM, Taylor CR. Case Studies in Nursing Ethics. 4th ed. Sudbury, MA: Jones and Bartlett Publishers; 2010. 34. American Nurses Association. Code of Ethics for Nurses with Interpretive Statements. Available at http://www.nursingworld.org/MainMenuCategories/EthicsStandards/CodeofEthicsforNurses/Code-of-Ethics-For-Nurses.html. Last accessed January 11, 2017. 35. American Nurses Association. Position Statement: Risk and Responsibility in Providing Nursing Care. Available at http://www.nursingworld.org/DocumentVault/Position-Statements/Ethics-and-Human-Rights/RiskandResponsibility.pdf. Last accessed January 11, 2017. 36. American Nurses Association. Official ANA Position Statements: Ethics and Human Rights. Available at http://www.nursingworld.org/positionstatements. Last accessed January 11, 2017. 37. Ross JW, Bayley C, Michel V, Pugh D. Handbook for Hospital Ethics Committees. Chicago, IL: American Hospital Association; 1986. 38. Kenyon P. What Would You Do? An Ethical Case Workbook for Human Service Professionals. Pacific Grove, CA: Brooks/Cole Publishing Company; 1999. 39. Congress EP. Social Work Values and Ethics: Identifying and Resolving Professional Dilemmas. Belmont, CA: Cengage Learning; 1999: 31-33. 40. Encyclopaedia Britannica. Lawrence Kohlberg: American Psychologist. Available at https://www.britannica.com/biography/Lawrence-Kohlberg. Last accessed January 11, 2017. 41. Crowley MA. Feminist pedagogy: nurturing the ethical ideal. Adv Nurs Sci. 1989;11(3):53-61. 42. Kokiko J, Watts DD. Ethical decision making in the emergency department: the R.O.L.E. acronym for four areas of consideration.J Emerg Nurs. 1995;21(3):219-222. 43. Marquis BL, Huston CJ. Leadership Roles and Management Functions in Nursing: Theory and Application. 8th ed. Philadelphia, PA: Lippincott Williams & Wilkins; 2015. 44. DeWolf Bosek MS. Ethics in practice: a student nurse's perception of right and wrong. JONAS Healthc Law Ethics Regul. 1999;1(3):16-19. 45. Commission for Case Manager Certification. Code of Professional Conduct for Case Managers with Standards, Rules, Procedures, and Penalties. Available at https://ccmcertification.org/sites/default/files/downloads/2015/0000.%20Code%20of%20Professional%20Conduct_FINAL%20%26%20APPROVED_January%202015.pdf. Last accessed April 27, 2017. 1. Mitty EL. Advance directives. In: Boltz M, Capezuti E, Fulmer T, Zwicker D, (eds). Evidence-Based Geriatric Nursing Protocols for Best Practice. 4th ed. New York, NY: Springer Publishing Company; 2012. Summary retrieved from National Guideline Clearinghouse at https://www.guideline.gov/summaries/summary/43915. Last accessed January 17, 2017. 2. Mitty EL, Post LF. Health care decision making. In: Boltz M, Capezuti E, Fulmer T, Zwicker D, (eds). Evidence-Based Geriatric Nursing Protocols for Best Practice. 4th ed. New York, NY: Springer Publishing Company; 2012. Summary retrieved from National Guideline Clearinghouse at https://www.guideline.gov/summaries/summary/43927. Last accessed January 17, 2017.